Forty years ago, scientists theorized a new kind of low-mass particle that could solve one of the enduring mysteries of nature: what dark matterDark matterA type of matter that does not interact with or emit visible light or other forms of electromagnetic radiation, as far as we know. Its existence is inferred by its obvious gravitational effects. is made of. Now a new chapter in the search for that particle has begun. This week, the Axion Dark Matter Experiment (ADMX) unveiled a new result (published in Physical Review Letters) that places it in a category of one: it is the world’s first and only experiment to have achieved the necessary sensitivity to “hear” the telltale signs of dark matter axions. This technological breakthrough is the result of more than 30 years of research and development, with the latest piece of the puzzle coming in the form of a quantum-enabled device that allows ADMX to listen for axions more closely than any experiment ever built. 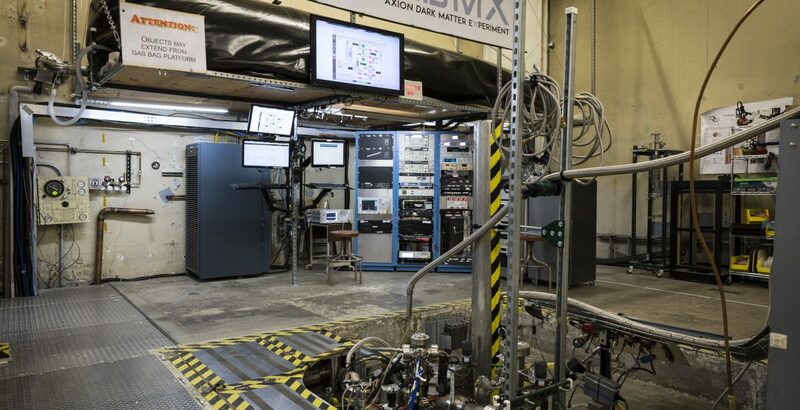 ADMX is managed by the U.S. Department of Energy’s Fermi National Accelerator Laboratory and located at the University of Washington. This new result, the first from the second-generation run of ADMX, sets limits on a small range of frequencies where axions may be hiding, and sets the stage for a wider search in the coming years. This detection method, which might make the “invisible axion” visible, was invented by Pierre Sikivie of the University of Florida in 1983, as was the notion that galactic halos could be made of axions. Pioneering experiments and analyses by a collaboration of Fermilab, the University of Rochester and the U.S. Department of Energy’s Brookhaven National Laboratory, as well as scientists at the University of Florida, demonstrated the practicality of the experiment. This led to the construction in the late 1990s of a large-scale detector at the U.S. Department of Energy’s Lawrence Livermore National Laboratory that is the basis of the current ADMX. Fixing thermal radiation noise is easy: a refrigeration system cools the detector down to 0.1 Kelvin (roughly -460 degrees Fahrenheit). But eliminating the noise from electronics proved more difficult. The first runs of ADMX used standard transistor amplifiers, but after connecting with John Clarke, a professor at the University of California Berkeley, Clarke developed a quantum-limited amplifier for the experiment. This much quieter technology, combined with the refrigeration unit, reduces the noise by a significant enough level that the signal, should ADMX discover one, will come through loud and clear. The unprecedented sensitivity of the ADMX instrument is also achieved, in part, by the low-noise cryogenic amplifier used as the second stage of the receiver. This specially designed amplifier, originally developed at the National Radio Astronomy Observatory’s Central Development Laboratory by Rich Bradley for the prime-focus receiver on the Green Bank Telescope, is ideally suited for ADMX, even when operating in a powerful magnetic field environment. 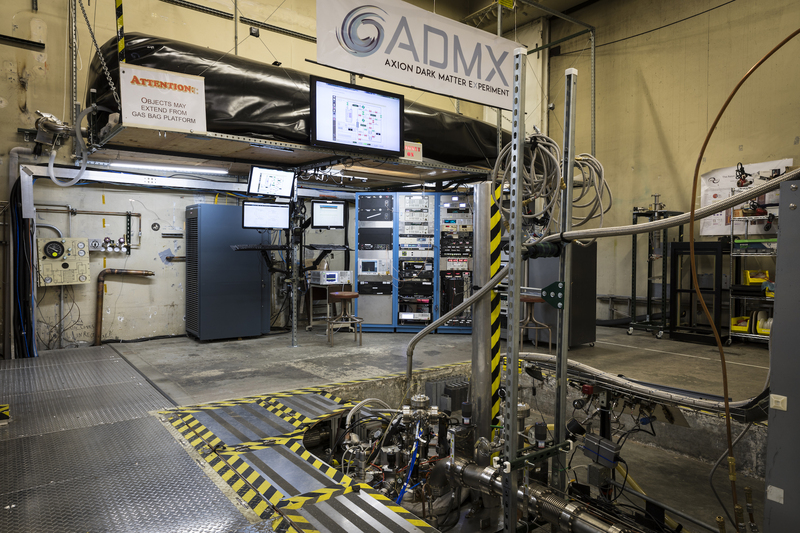 Inside the ADMX experiment hall at the University of Washington. The ADMX detector is underground, surrounded by a magnetic field. 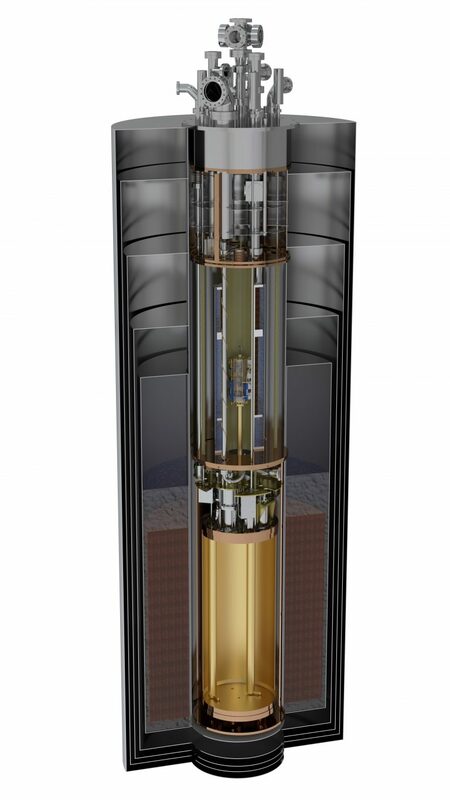 A cutaway rendering of the ADMX detector, which can detect axions producing photons inside its cold, dark interior.